Former Ukrainian prime minister Yulia Tymoshenko speaks during her interview with The Associated Press in Kyiv, Ukraine, Feb. 4, 2019. Former Ukrainian prime minister Yulia Tymoshenko, who is running for president in next month's election, accused the incumbent of corruption — charges his office rejected as a lie as the race was heating up. Tymoshenko told The Associated Press in an interview Monday that President Petro Poroshenko has used his position to enrich himself. She also alleged that Poroshenko's associates have engaged in a sprawling effort to bribe voters to ensure his re-election in the March 31 presidential vote. 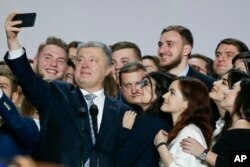 FILE - Ukrainian President Petro Poroshenko takes a selfie with supporters in Kyiv, Ukraine, Jan. 29, 2019. In 2014, Forbes estimated Poroshenko's fortune at $1.3 billion. The value of his assets has shrunk since then. Tymoshenko served as the country's prime minister in 2007-2010. She later spent two-and-a-half years in prison for signing a gas deal with Russia, which was largely viewed as retribution by her political rival, then-President Viktor Yanukovych.